A small crew of what is either a family not from around here or the entourage from a reality show stands in the middle of a sidewalk in Portland, Maine, slathered in sunscreen and taking pictures of each other posing in front of a bell that someone else's child is hanging from by his feet. Another small group is speaking in foreign tongues, walking at a snail’s pace across the street while drivers tap their steering wheels, pointing wildly to street signs I’m pretty sure they can’t read, referring back to an area map that doesn’t have enough pictures for them. A blur of bicycles whizzes through an intersection against the light just as yours turns green and you have pulled forward, evoking a rather direct one-fingered response from no less than three of the riders. Ice cream vendors and sandwich trucks have taken their stand on every corner, there is a line starting to curl into the street for the Duck Tours because nobody understands the concept of waiting on the sidewalk, and it takes 20 minutes to drive three blocks because of this pesky “Pedestrians have the right of way” law. Yes, friends, it is tourist season in Maine. Why isn’t the term “tourist trap” literal? To be truthful, I usually don’t mind it so much – after all, tourism is the livelihood of many Maine businesses. On occasion I will even offer directions (as if I know where anything east or north of Commercial Street really is) and suggest restaurants (most often for those who have paid a trillion dollars for an all-inclusive cruise) and smile at their blank faces as they try to keep up with the flow of pedestrian traffic and not break their necks on the bubbled up brick sidewalk while trying to recall how many children they started out with once they finally all decide on a place to eat or shop or stand bewildered. As you are aware, this year Independence Day happened to fall on a Thursday, and many people had Friday off to give them a nice, long weekend. All the more reason to avoid Portland like the Plague right now. So what did we decide to do? After clawing my way through traffic Wednesday afternoon and avoiding colliding with wanderers looking for a place to eat (it is a rare sight to have less than three restaurants on one street here – just pick one already), strollers which have evolved into SUVs since my kids were in them, and pets that the locals are trying to maneuver around the map-reading visitors, the plan was to go back to Portland – on the holiday - to board a boat for fireworks. Chances of finding a parking space? Stop laughing, please. I do have a garage parking pass and I am a monthly parker, so I figured we might be able to jam our Fusion in next to a Yaris if it’s parked by a cement divider. Let me get back to the boat part. Boats and me – not close buddies. And that’s in the daylight. So the idea of packing like sardines onto a boat with who-knows-how-many others, cruising around before the fireworks actually started, waiting for it to get dark, which obviously meant being trapped on this vessel (when was this thing inspected last?) heading who-knows-where for who-knows-how-long before the boat and my stomach stopped lurching – I’ve had better offers. Because I wasn’t in any hurry and was possibly trying to avoid actually making the trip (this is not an admission, just an observation) we found ourselves in a sudden rush to grab sandwiches at the local Subway, hightail it out to Portland, find (thankfully) a parking space on the top floor of the ramp garage (there is power in the monthly parking pass) and walking as swiftly as possible through sightseers, animals, musicians, disgruntled homeless people whose spots were taken by the musicians, jugglers, and a few kayakers who took a wrong turn on Wharf Street. We made it to the boat with ten minutes to spare. My head was spinning as we climbed aboard. What if there was a freak storm and we were taken out by a lightning bolt? What if the boat had a flat tire – or whatever the equivalent would be on a boat – and we were stuck out here (and none of the other 638 boats noticed our distress call)? What if… wait – do the kids know where our will is? Should I text them our attorney’s name and phone number just in case? The boat headed out to open water, filled but not sardine-filled. We sat on the top deck and had a lovely view of the captain’s little box where he offered Cliff Clavin-type trivia into the loud (emphasized) speaker facing us. Really, the views (to the side) were gorgeous and I snapped what could have been several award-winning shots with my Droid. It was a perfect, sunshiny evening and we munched on our subs in contentment as time passed over the calm waters. I had been sure the hours would drag – what can you possibly do from 7 p.m. to 9:30 p.m. on a boat while you wait for fireworks? As it turns out, you can just relax and relish rather than resist the fact that you are not in control. But you and I know it’s never that easy. I worried about the two little girls who were having the time of their lives running back and forth, up and down the steep stairwell. I worried about the kid two seats up who was several shades of green and complaining about not feeling well. I worried about whether or not my turkey sub was going to settle each time we were hit by a wake from some sleek motorboat zipping by in a hurry to get to…. why do you hurry to get to anywhere when you’re on vacation? Eventually I ran out of things to worry about – except for killing the battery on my cell phone because I was so entranced with taking pictures of the sunset and later, the celebratory bursts of light in various colors and design. 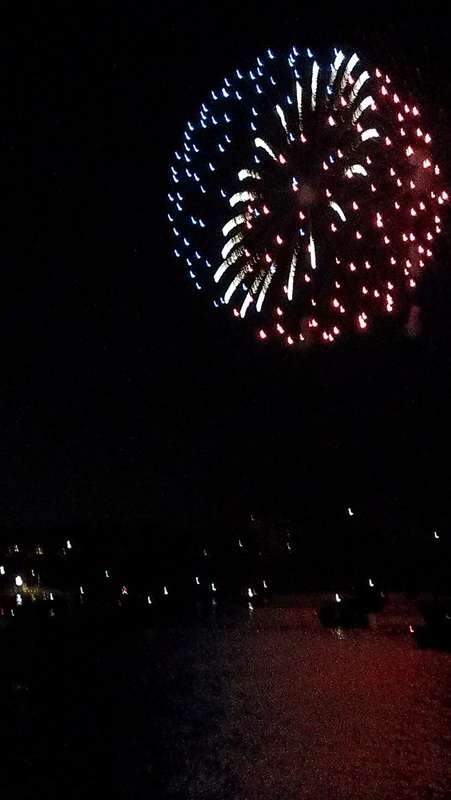 I didn’t even worry (but probably should have) about sitting in traffic along with the thousands of others on shore who would be slinking down the hill after the pyrotechnics and a concert with Don McLean singing his 27-minute version of “American Pie” under the stars. The night was beautiful, the company pleasant (we chatted it up with another couple on the boat for some time), there were no sick souls hanging over the edge, and though a few of the more ‘seasoned’ viewers kept hoping for a bigger display of illumination instead of a steady lineup of single shots until close to the end, all in all it was an excellent way to spend the evening. Following a 40-minute display (with music piped in to add to the patriotic ambience) we set about making our way back to the car. Oh, right, the car. On top of the roof of the ramp garage. Whereupon reaching said car we could see nothing but glaring headlights en masse coming from all directions, seemingly linked in Slinky fashion with three inches of space between them. Do we sit it out until traffic clears at dawn? Do we brave this frontier and plunge head on into the fray? Are there bathrooms up here?? Fine, let’s go. Down we went, circling the floors of the garage, which almost nobody was leaving because most of them were either staying in a hotel or out on one of the many islands we had passed on our pre-fireworks tour. That was easy! And then we got to the street. The steady stream of cars could be reckoned with because they had to stop for the intersection traffic lights. The pedestrians, on the other hand, made their own rules – and none of them involved letting the cars move. They watched the “Walk” light turn magenta as it flashed the obvious “DO NOT WALK” sign (actually it’s the shape of a pedestrian in red, blood spatter I believe, laying underneath the tires of a car making little moaning sounds – you would think this should be effective, yes?) and simply continue walking with the crowd, assuming no 2,000 pound hunk of metal could possibly pummel through the three-person-deep swarm. A little less pedestrian bonding, please? So sit we did until finally we saw an opening… or rather, made an opening. I did worry some about S deciding to loudly proclaim his disgust with “Stupid people” who crossed against the light so we almost didn’t make it through. The last time he mouthed off at someone from the car window, we had a tattooed, bandana-wearing…. errmm… tourist… on a Harley spin a 180 at a 4-way traffic light and pursue us with a vengeance. We managed to ditch him somehow but not before almost having to have the car seats cleaned. It is a memory that stays with me, which of course means that it will stay with S because I will resurrect that story any time he thinks about yelling something – anything - out a car window. Fortunately, this time they would have had to chase us on foot, so we were ahead of the game. I know all these people could not possibly live in the area. 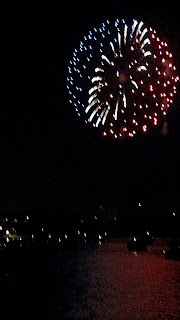 I know Portland, Maine does not have the biggest, most exciting Fourth of July Light in the Sky displays in New England. And yet, we sat at each light (six of them to be exact) for approximately five minutes before we got to the highway. That doesn’t sound like a lot – except you can only fit four cars at a time on each strip of road for these lights. Again, the pedestrians ruled – not even trying to make it look like they were in a hurry or at all concerned for their own safety, some taking long looks around at various buildings, some talking on cell phones as they ambled across the street in front of idling motorists, some staring into our windshields as if daring us to make a move. I was genuinely afraid one of them would growl, “You want a piece of me?” which S would reply to by gunning it. Eventually we made it to the highway and arrived home, worn out but content, some time after 11 p.m. I could sleep in Friday morning since our office was closed, but S had to be at work. It was the first time in I don’t know how long that I had the house to myself for a day. It was a little befuddling and took me a while to find my stride. I got lost twice going to the kitchen because the animals weren’t trying to trip me in the hall, leading me to their dishes (S had fed them) and wasn’t sure if it was all right to drink the coffee since there was only one cup next to it (I will explain the “matching cup” obsession I have at a later date). I tried not to think about how I could get used to this, because I can't, but I did make the most of the day and it flew by, naturally. Is going back to reality really necessary? In the end, it was a successful and enjoyable holiday and long weekend. YK will be home Sunday evening and the countdown to her entry into college begins in earnest. It was good practice to have her away this past week visiting OK in Philadelphia – a trial run so to speak for S and me. So far neither of us has been kicked off the island. I am hopeful we will survive the Empty Nest. Now I just have to make it through the tourists, crafters, musicians, requests for change, lobsters in costumes, and restaurant chalk menus half the width of the sidewalk, all within the two blocks between the garage and my office on Monday. Proof enough that only the strong survive Vacationland.